In 1944 Nellie Henderson Dorn and Fred Dorn started action to have some of their property on Dorn Point set aside for what is now Clear Lake State Park. In 1945 Lake County accepted approximately 50 acres, to include the mouth of Kelsey Creek, and in 1947 Mrs. Dorn donated another adjoining 250 acres. 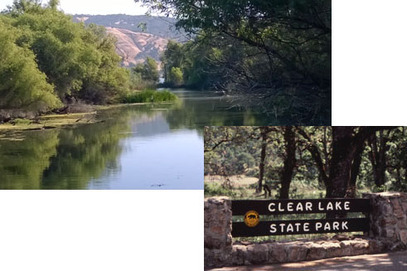 In 1948, the State of California accepted the land from the county and began development of Clear Lake State Park. Other acreage has since been added, to total 565 acres, and the park today is a water orientated area, with 11,600 feet of shoreline on the south shore of Clear Lake … a popular area for recreation enthusiasts. The Lake County State Park celebrated the 150th anniversary of California State Parks (2014) with their new addition to the Lake County Quilt Trail. 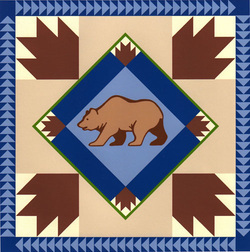 The 'State Park Bear Paw' quilt uses traditional quilt designs of bear paw and flying geese in the block, along with the blues of the Pacific and golds of our rolling hills. The California grizzly bear was designated as the official state animal of California in 1953. The 8' x 8' quilt block is mounted on the building at the park front gate. The Lake County Quilt Trail project is the first in the California to place painted quilt squares on highly visible barns and buildings throughout Lake County. It is an agricultural and tourism project designed to promote and celebrate community pride. For more information about the Quilt Trail and for a map of the trail, please see their website, http://www.lakecountyquilttrail.com/.